Next – sparkly pink muskies? No one keeps up with the latest trends like Babs Young. She is the coolest aunt in northern Michigan. She writes: Here it is the week of the 4th of July and you just never know who you will find sunning themselves on a dock in Blue Heaven. This group is enjoying a fun afternoon of sun and later snacks and a barbecue. I hope each of you had a great 4th of July and were able to keep cool. By which we know that The Twins were here for the holiday, and they brought reinforcements. I never knew there were so many kinds of Barbies. I figure sooner or later there will be a very attractive Fishing Barbie, complete with sparkly pink tackle and a giant muskie fresh from Torch Lake. Man, what’s in your water? That is an excellent question. I am fresh out of excellent answers. Well, look at that. I intend to send this both to NOAA and NPR. I think there needs to be a revision to the story ! Perhaps if they are in cold, deep Torch Lake they are not, strictly speaking, mer-maids? Lovely poses, especially the mermaid, though I would have expected she’d be dangling her tail in the water to stay fresh and cool in the heat. Maybe there IS something lurking in that water. The variety of Barbie dolls that are on the prowl these days boggles the mind. My favorite is Barbie’s little sister Kelly, created with the proportions of a 4 year old, in a wonderful global variety of eye, hair and skin tone colors. I take my collection (acquired over time at Value Village) to the preschool and they keep the little girls content for longer than most other toys. ‘Reinforcements’ describes them perfectly. You are full of surprises, Amy-Lynn. There are many things under the waters of Torch Lake. Fortunately, most of them are benign. And edible. 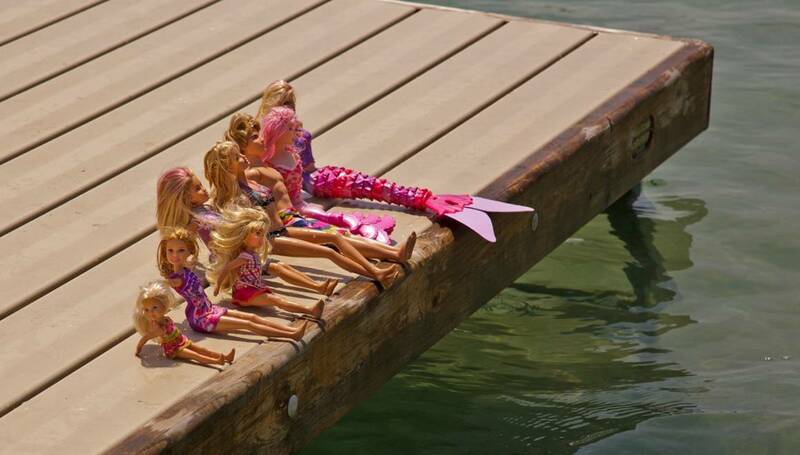 I wouldn’t be at all surprised if there was a pink sparkly “gone fishin'” Barbie. It seems like instead of just selling new clothes and accesssories for Barbie, they just make another doll. My girls are well past the Barbie age, but there is still quite a collection of them in my basement. Oh. My. Goodness. Muskies beware. um…? I think I had a Barbie…I distinctly remember my Mom making clothes for it. What a pain that would have been, all those tiny seams…But at least back then I think there was just one Barbie…though you COULD get a house and a car and maybe a yacht. We just got the doll and one set of store bought clothes…between the two of us sisters. Worked for us. Just before Barbie there were “8-inch dolls.” Not the elaborate Madame Alexander ones, but ordinary little dolls. Ginny dolls, I think. The whole idea of Ginny dolls was to buy sewing patterns from McCall and Vogue and Simplicity – and then make adorable little outfits from scraps. That is not something I would have done ever in this particular life, but the idea of it appeals to me even now. For some reason I was unmoved by Barbie. Probably would’ve become an instant convert if she’d come with a stage and props. I was always going to be a theatrical impresario.